In this cartoon Thomas Nast presents a careful parody of illustrator Robert Seymour's celebrated initial plate to Charles Dickens' landmark novel The Posthumous Papers of the Pickwick Club. 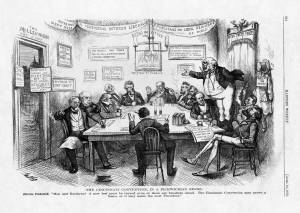 Better known as The Pickwick Papers, this book appeared serially in 1836-1837. The tale begins as Mr. Samuel Pickwick, Esq., "mounted into the Windsor Chair on which he had previously been seated, and addressed the club he himself had founded."